Leaning an extension ladder against house gutters is a common practice. As you well know, this is not only unsafe, it leaves dents, scratches and creases in gutters for years to come. We've all done it. That's why we distribute Ladder-Max. Ladder-Max is the first ladder stabilizer to be certified for roof placement. Leaning an extension ladder against house gutters is a common practice. As you well know, this is not only unsafe; it leaves dents, scratches and the creases in gutters for years to come. Ladder-Max is the first ladder stabilizer to be certified for roof placement. Placing your Ladder-Max against the roof will avoid damage to gutters, eaves, overhangs and metal siding. Your ladder will never damage your gutters again. 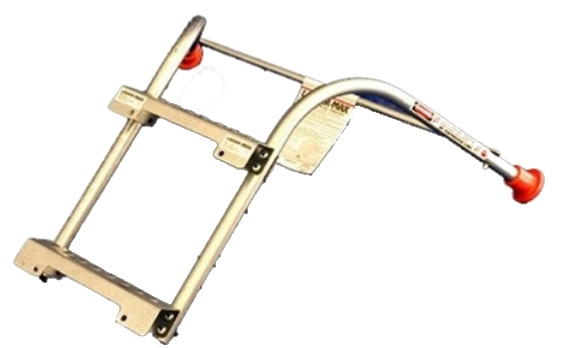 A GREAT TOOL FOR TRADESMEN FOR ANY JOB THAT REQUIRES AN EXTENSION LADDER! Improves access around overhangs and windows. Protects gutters, roof edges, fascias, siding and paintwork. Provides a more comfortable and effective work angle. 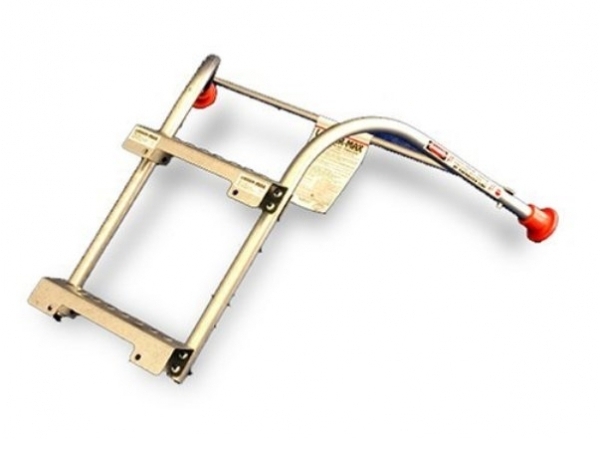 Attaches to and from ladder in seconds. This is a professional grade stabilizer. No other stabilizer on the market can compare to the benefits and features offered by the Ladder-Max. Made of steel, the Ladder-Max provides the strength required to handle a true work load. Ladder-Max's 19 inches of standoff lets you stand at a natural position. You can reach further with less effort. (Our competitors' products offer a maximum of 10 inches). Designed and certified for roof placement, Ladder-Max will reduce your business liability by eliminating the need to lean the ladder against eaves, gutters or roof edges. Our competitors' products are for wall use only. 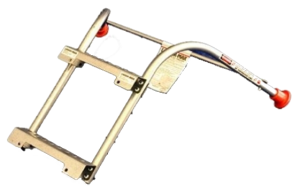 Fits fiberglass, aluminum, wood and articulated extension ladders with 12" step or rung spacing.